The Tokyo Disney Resort is a magnificently beautiful pair of parks, but it carries the interesting quirk of not allowing tripods of any kind to be brought into either Tokyo Disneyland or Disney Sea. The reason is understandable: the parks can often be exceptionally crowded, and tripods would further clog up traffic. But the ban does make it more difficult to get those long exposure night shots that Disney park fan photographers like myself are wont to do. So we have to get creative: use a nearby trash can, brace against a pole as much as possible, take a railing, or even utilize the ground to support the camera in its open exposure without shake. This inconvenience also has a fortunate side effect of forcing creativity, yielding perspectives that one may not normally consider when given the freedom of setting up a tripod wherever. 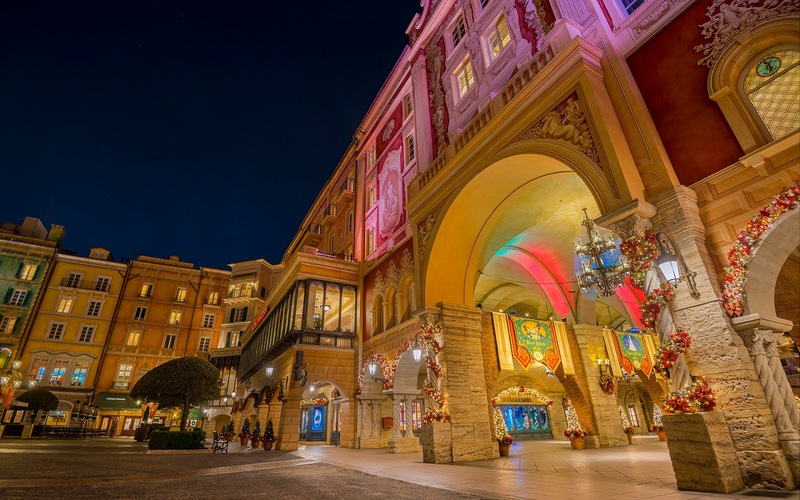 Creativity is borne of constraints, and I think Tokyo Disney provides a fitting example of how people can respond to the challenges imposed, all to capture the grandeur of the Resort! The stillness of a holiday night at the entrance arcade of Tokyo Disney Sea.